HOUSTON (KTRK) -- The two Houston police officers who came into contact with a man accused of causing four separate car crashes -- two of them deadly -- are facing an internal investigation. Houston police confirm an internal affairs investigation is underway. Blaine Boudreaux told police he was on anti-depressants the day they say he got behind the wheel and hit and killed two people. It was an emotional morning for the family of six-year-old Joshua Medrano, coming face to face with the man accused of killing their son. He's accused of four accidents, two of them leading to the deaths of that six-year-old child and a homeless man. On Wednesday morning he faced a judge. Blaine Boudreaux, 34, was in handcuffs as the judge read him his rights. He's charged with three counts, from intoxication manslaughter to intoxication assault and failure to render aid, resulting in a death. On Sunday, April 26, Boudreaux allegedly was involved in an accident at 3:30pm that sent a two-year-old and an adult to the hospital. Carmen Esparza was in her Kia when a car first struck by Boudreaux's truck hit her. "I don't know if he was in shock, or if he was on something, but he looked like he was not actually there, trying to help something out," she recalled. A Houston police officer did respond, but Boudreaux was given a ticket and allowed to leave. The DA's office says Boudreaux then later drove off the road and killed a homeless man, Leonard Batiste, who was sitting off the road. Then, at around 5:30pm, investigators say Boudreaux hit another car at Westpark and Weslayan. Another eyewitness said that Boudreaux acted strangely after that accident too. She said, "The minute Mr. Boudreaux stepped out of the vehicle, I immediately got the feeling like something wasn't right. I trust my instincts." A police officer responded there, too, but again, Boudreaux was allowed to leave. About 30 minutes later, he was involved in another accident that killed six-year-old Joshua Medrano and critically injured his mother. Esparza wondered, "How come they didn't stop him after the second accident, why did they let him keep going?" That's a common question among the many crash victims. Houston Police Chief Charles McClelland wants answers. "I want know if any of our actions could have detected something was wrong with the individual, that he shouldn't have been behind the wheel of a vehicle," said McClelland. He says, right now, there's no indication the officers did anything wrong. Court documents show Boudreaux left his front bumper and license plate where the homeless man was found. And where the six-year-old died, witnesses say Boudreaux had passed out at a street light before gunning the gas pedal and hitting the boy's car. Joshua's family was extremely distraught in court, crying the entire time. At one point, one family member shouted out, "I hope you die ... expletive" as Boudreaux walked out of the courtroom. 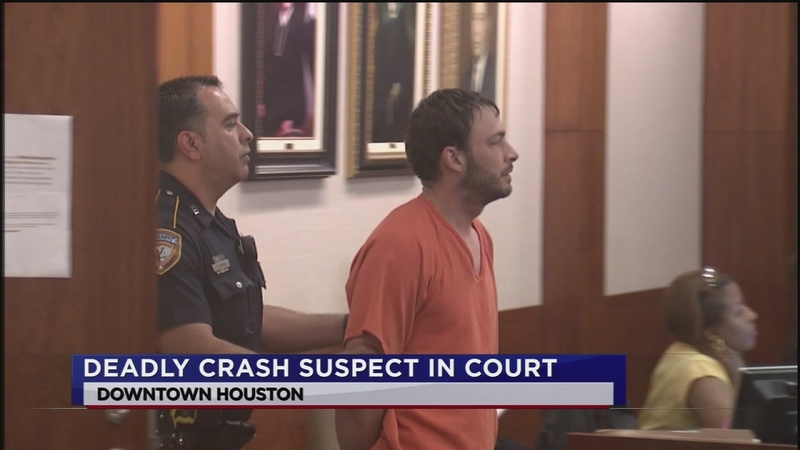 "We received some information from New Orleans that the defendant has some prior DWI cases that appear still to be open, which leads us to believe that he is a flight risk in our county," said Alison Baimbridge, Chief of the Harris County District Attorney Vehicular Crimes unit. "Those cases he was on bond for, never finished the case, they were never disposed. So if he's a flight risk in one county and state, and fled to another state, it causes us some concern. We would like to find justice for these families, so we would like him to stay here until this case is disposed." Because Boudreaux has several outstanding warrants for DWI in Louisiana, and also jumped bond on one of those cases, bond was raised to $100,000 for each charge of his three counts. In court, it was also revealed that Boudreaux took a drug that curbs opium addiction and consumed alcohol that same day. The results of toxicology reports may lead to further charges.